Detailed reports of an active landslide on Rattlesnake Ridge, near Union Gap just south of Yakima, WA are available from "Seismic Monitoring of a Slow Landslide" in January, 2018 and "Continued Landslide Monitoring" in March 27, 2018. At the end of March our seismic event counter was recording about 180 tiny events per hour on two of our stations with the highest activity (UGAP6, on the slide and UGAP5 ~20 meters away right next to the high scarp on the east side of the slide). Currently this count is down to about 100 events per hour. Similar to the event counts the geologists monitoring the slide with geodetic techniques report that the rate of motion has gone from 1.7 feet per week to about 1.2 ft/wk on the fastest markers and to less than 1.0 ft/wk on some of the slower markers. There is some scatter to both sets of data but the decrease is clearly seen when looking at the whole period. Below is an extracted plot from our Tiny Event Counter Display (events per hour) for the whole period we have been monitoring (first of the year, 2018). Note that from the time that UGAP5 (green) and UGAP6 (black) were installed in late January they have had the highest counts of our four stations. UGAP5 started right out with about 180 evts/hr and UGAP6, while starting out at about 100 evts/hr caught up to and was tracking UGAP5 closely by the end of March. Since then they both have been gradually decreasing in little bumps and flat periods. UGAP3 (red), located near the top of the slide may be mimicking this same pattern but at much reduced levels (~80 evts/hr to ~60evts/hr). UGAP2 (blue) is located about 100 meters from the slide and only records the larger events so there is not enough resolution to see any pattern in its data (and it is partially cut off in this sample plot). One might wonder what the significance of this slow down is. While there is still a possibility that it could speed up and fail catastrophically, this scenario seems less and less likely. The more likely forecast (from me, a seismologist with little to no geology or landslide expertise) is that it will continue to slow ever so slightly until it reaches a threshold rate and then will stop. Of course, this rate may be so slow that the exact time of stop is hard to tell. There is always some noise in any data thus defining a count threshold meaning "stopped" may not be obvious. In the meantime we continue monitoring but at a lower priority than early in the sequence. One might notice that about two weeks ago the seismograms for station UGAP5 changed to random motions and that the counts for it had a big jump and then goes to zero. This change took place in the very early morning and there was no evidence on the seismograms of a vehicle driving up or people walking near the instrument. Just today the cable to the seismometer for this station was found by a colleague to have been cut in two places. While the cuts look fairly clean (see photo below) there is evidence of chew marks. We think some sort of rodent doesn't like landslide monitoring and/or likes to eat seismometer cables. 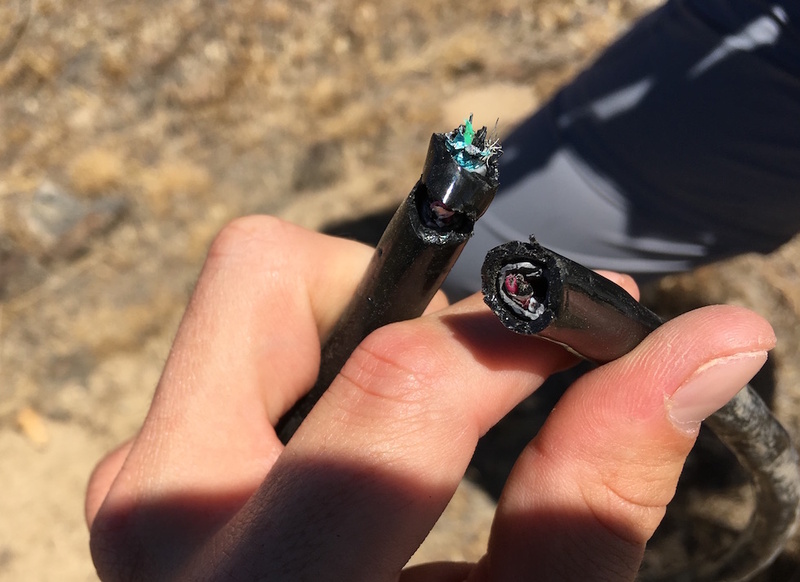 In any case we will try to replace the cable next time someone is in the area but no special trip will be made for a repair. I.e. repairs are a lower than normal priority since other stations are working fine. Lets hope the rodent got indigestion from this bite and doesn't try to find more. Anyone driving along I-82 near Union Gap can obviously see the landslide from the road. While it does seem to be slowing down it is still pretty obviously not a normal geologic feature. Here is a recent photo from the monitoring camera just across the river from the slide run by the UofO and UofN. Since the end of June one of our stations, UGAP5 has been dead as reported above. Since both UGAP6 and UGAP3 were working fine and we also had UGAP2, even though it is far enough away to only detect the larger events, we didn't rush to fix things. This is the height of our field season and with limited staff and almost 400 permanent stations in Washngton and Oregon repairing and servicing the network as a whole is the highest priority. However, this week a couple of our star technical staff broke away to make a trip to Rattlesnake ridge and repaired UGAP5. 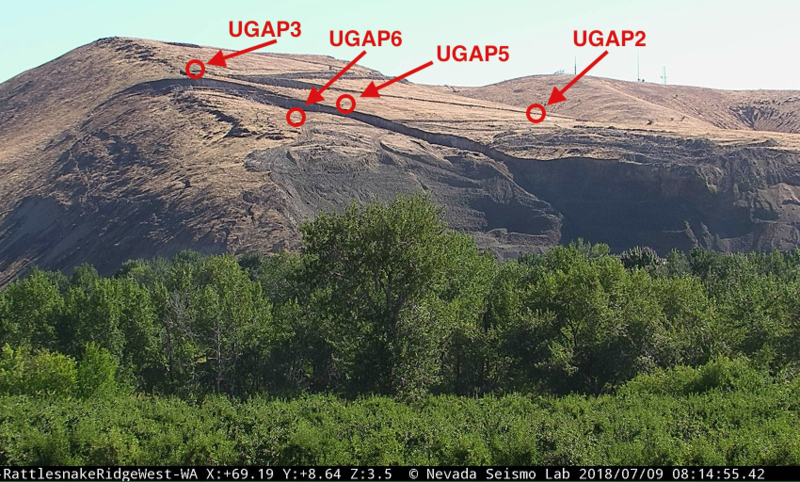 They also pulled out UGAP2 since its equipment is needed for an experiement in the Puget Sound area that will be starting soon and it is not a critical station for monitoring the landslide. Looking at the event counter display one can see where UGAP5 went dead just over a month ago and where it came alive again a few days ago. The repair of UGAP5 will help in a minor way for ongoing monitoring efforts and UGAP2 will not be missed. One other observation worth noting is that the decrease in number of events reported back on July 9 has not continued. Over the past 3-4 weeks the number of events detected by our event counter has remained constant at about 100 events per hour (on UGAP6). The count number on UGAP5 over the past couple of days remains just slightly less than that. We expect these two stations to track each other pretty closely. Reports from the group doing geodetic monitoring reports that the rates of motion of the main part of the landslide has also stabilized at about 1.2 ft/week over the past 3-4 weeks. This is encouraging that our two very different ways of monitoring motion are consisent in reflecting changes.